What channels have the greatest impact on consumer satisfaction? How do they define convenience? And what banking products will they be adding? In Q3 2013, CFI Group launched its first ever Bank Satisfaction Barometer, the fifth in a series of national industry studies conducted by the firm. Researchers asked bank customers about the products they use, the channels they interact through and about the problems they’ve experienced and, perhaps most importantly, their bank’s ability to effectively resolve problems when they occur. Bright spots for the industry appear both in digital and brick-and-mortar channels. Researchers dispute the “death of the branch” theme that some have put forth, saying that physical branches and the people in them have a significant impact on consumers’ current and future levels of satisfaction. They also found online interactions occurring slightly more frequently than branch visits and mobile apps are coming on strong, a service consumers are generally happy with. On the down side, rates and fees continue to be a challenge. With the Fed’s easy money policies continuing for the near future, improvements on the rate front are not expected to improve anytime soon, leaving little wiggle room for financial marketers hoping to attract new customers. To and attract new relationships — and retain current ones — researchers say banks and credit unions should focus on one thing: improving the experience they offer. Researchers calculated the impact of each component affecting consumer satisfaction in order to determine where financial institutions should concentrate their efforts. The donut below shows the relative impact of seven different drivers, prioritizing which ones would most likely trigger increases in overall consumer satisfaction scores. Effective problem resolution is a key indicator of overall customer satisfaction with the institution. The study found satisfaction scores for those who had their problems resolved successfully were twice those who didn’t. 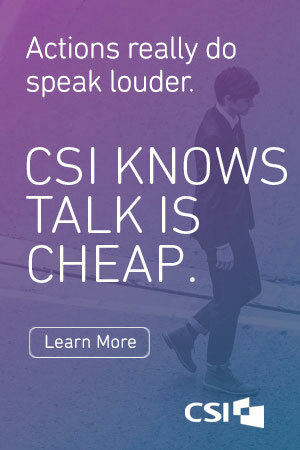 A word of caution, however: Don’t put too much emphasis on this subset of disgruntled consumers. Research indicates that only about 10% of respondents experienced a bank problem; 25% never bothered to it, making resolution impossible. Despite the problem areas where consumers are less than thrilled with their institution’s performance, 57% of respondents said they had given a word-of-mouth recommendation to others about their bank or credit union. Nearly 30% of respondents said they were planning to sign up for additional bank services in the near future. Only 27% said they did not plan to sign up for anything new from their banks, while 44% were uncertain. Among consumers who said they will be adding bank services in the future, 31% said they’ll be looking for a savings account. A credit card was in the works for 28% of those planning to add banking products, and one in four said they would get another checking account. One fifth said they will take out a car loan, while 18% are interested in a CD. This data suggests that as many as 9% of their total customer base could be interested in a new savings account next year and perhaps many more if some customers from the 44% undecided actually make the choice to deepen their bank relationship in the future. An analysis of delivery channels revealed that 82% of consumers interacted with their institution through its website within a 30 day period. 77% of consumers visited their branch in the last month, with ATMs following closely behind (71%). 37% used the telephone and 35% used a mobile app. Remember, mobile apps are only a couple years old now, and they are being used by over a third of all consumers in any 30-day period. 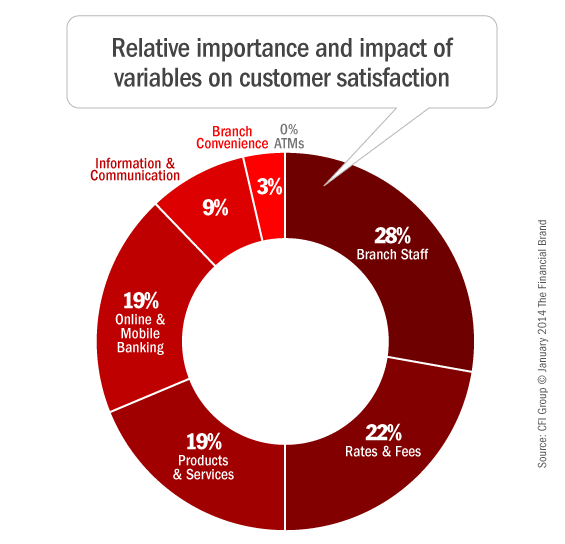 According to the study, nearly 40% of new customers chose their financial institution because of branch convenience. Another 21% switched based on the recommendation of someone they trust. 17% said they came into the bank relationship because they felt the institution had the right mix of products and services, and only 10% said that the attractiveness of rates and fees was the deciding factor. What Makes a Branch Convenient? The banking industry talks often about “branch convenience,” but how is that defined? 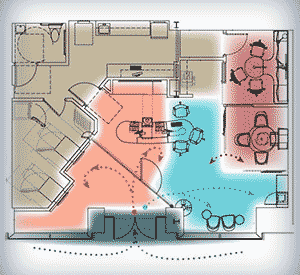 Most people assume it simply boils down to geographic proximity. CFI Group decided to look at satisfaction levels through the lens of “convenience” to see what factors had the greatest impact. No, surprise: location ranks first. But researchers identified three other key factors influencing consumers’ perceptions of “branch convenience”: time spent waiting in line, adequate parking, and operating hours. More and more financial consumers expect to take their bank or credit union with them on the road these days. An analysis of consumer attitudes towards mobile banking found a high correlation between usage and satisfaction. In short: the more people use these apps, the more they like them. By the time someone is doing over 75% of their banking on a mobile app, satisfaction scores are near perfect. However, researchers are keen to note that this may simply be the result when consumers have had sufficient time to practice with the mobile app; the more the consumer interacts with the app, the more proficient they will become with it, which could yield a higher level of satisfaction. Researchers wanted to know more about why those consumers who were not already using mobile apps were not eager to do so. When asked, 45% said they don’t use mobile apps in general. 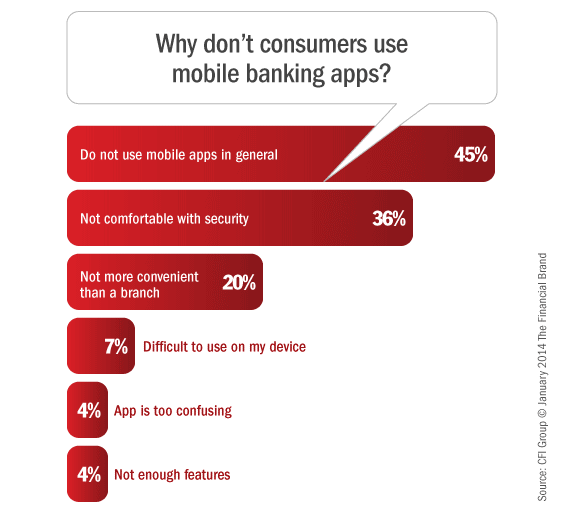 36% said they were not comfortable with the security, and 20% said that the mobile app was not more convenient than the branch. Another 7% of respondents said it was difficult to see the app on their device’s screen. 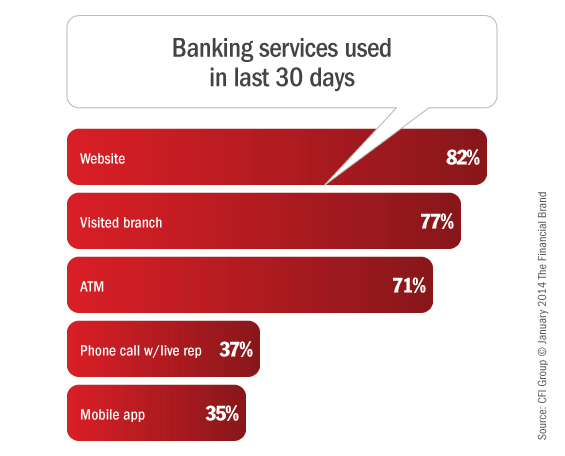 Bank customers seem to be using their mobile apps primarily to ping their institutions for information. For instance, 84% of respondents said they used their bank’s mobile apps for checking their account balances, and 57% said they used it to obtain general information from the bank. Just over half (54%) of those using a mobile app said they used it to transfer funds amongst accounts; 41% said they performed deposits and 44% said they used a mobile device to pay bills. This article was originally published on January 14, 2014 . All content © 2019 by The Financial Brand and may not be reproduced by any means without permission.